It’s that season. Long summer days. Water wherever you can find it. Popsicles. Bees. 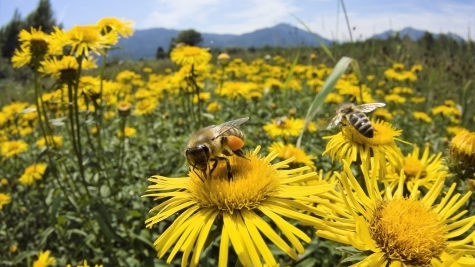 If the latter spoils all of the former, chances are good you have a bee-phobic kid. A phobia is defined as a persistent, intense (to the point of irrational) fear that compels the sufferer to avoid the object of fear. Soon, anything associated with the fear becomes risky. A trip to the park (the one with all those beautiful flowers) – no thank you. A game of Frisbee on the lawn – pass. A walk to the ice cream shack on the beach (past the trash cans full of sticky ice cream wrappers) – can’t you go get it for me??? Phobias lead children not only to avoid, but also to strengthen the very loop that keeps anxiety (in all forms) going: worry > avoidance > relief, and the growing belief that the only way to get relief once worry kicks in is to avoid the object/situation of fear or engage in some other "safety" behavior (more on that some other time). For now, back to bees. Summer is a wonderful time to help your child overcome his fear of bees, and gain important self-help skills in the process. If you haven’t already read my article Fears and False Alarms, you might want to go back and do so now. It provides the background for understanding phobias and the main tool used to treat them: desensitization. Desensitization means getting used to something, and it can be applied to any phobia, including the fear of bees. Think of the process as climbing a ladder, your child proceeding up the rungs one at a time. Explain desensitization to your child (again, my other article will be helpful to those not already familiar with the concept). Use the analogy of climbing a ladder or staircase to get to the top, or of gradually descending the stairs into a pool, getting used to the chilly water a little bit at a time. For bee phobic children, the thing they will be getting used to is being around bees, and the places bees hang out. Generate a list of desensitizing activities. Brainstorm with your child a collection of bee activities, everything from looking at pictures of bees online to studying dead bees in jars. Drawing bees, looking at close-up pictures, standing near flowers attractive to bees, and going on a bee scavenger hunt to see how many you can find all might be on the list. Be creative. Include all ideas, even those your child isn’t close to being able to do. When it comes time to climb that particular step, she will be ready. Have your child sort the list into activities that seem easy, medium and hard. Or have her put the list in order from easiest to hardest. Either method is fine. Begin with the first (easiest) item on the list. Or take the items in the "easy" pile and have your child select one at random. Your goal will be to do an item from the list – either moving in order of difficulty or tackling one category at a time – as close to daily as possible. Think in terms of spending 10 minutes or so per day, every day. Frequency and repetition are key. What happens with desensitization is that your child gets used to whichever step she is on while receiving valuable corrective information about the real danger (rather than the fear-distorted perceived danger) of whatever she is doing. As tempting as it might be, don’t skip steps on the hierarchy, and don’t attempt to race ahead. If your child is working through the "easy" items and is still getting used to pictures of bees, YouTube clips featuring bees, drawing bees, and looking at dead bees from a distance, don’t push him to go blackberry picking (where there are sure to be bees) or chide him for running from a bee he encounters outside. Stay on each step until your child is able to do it relatively easily. Your child might master a step the first time he does it, or it might take fifteen or sixteen exposures. Put in whatever amount of time it takes, then move on. What to do about accidental bee encounters? Take reasonable measures to prevent accidental encounters above the level your child is working on. Yes, it is okay to go get the ice cream for him, or to find a barer (less floral) park; these will be temporary measures, designed to avoid having your child reactivate his intense, irrational fear by reaching for a step beyond his ability. Funny thing about bees, though: they aren’t going to know/cooperate with the plan. If your child does accidently encounter a bee, stay calm. If your child runs, join him and say something supportive, "Too bad we can’t get the bees to cooperate with our ladder, huh?" or "That was too many steps ahead of where you are." 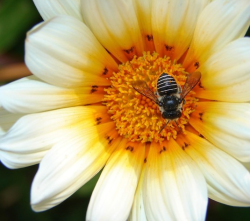 Help your child calm down, then present a bee-challenge at his level. Encourage him to come back outside (if he has run indoors) or to walk 3 steps closer to wherever the bee was (if he has hightailed it to another part of the yard) and play a little brain game (I Spy, or counting people wearing hats, or some other diverting challenge). Keep moving through the hierarchy. Make it fun. When your child is on harder items – learning to tolerate staying in bee-likely locales and to remain in place when there is a bee in sight – combine the step she is on with games and challenges. Go on a bee photo hunt (see who can take the most interesting pictures of bees); put out little bowls of a variety of sweet foods (melted ice cream, juice, honey) to see which is of most interest to bees (stand nearby to watch the bees); read about various forms of stinging insects (bumble bees, wasps, hornets) and challenge your child to identify what he sees. Do a bee activity every day. Moving slowly but steadily through a fear hierarchy is incredibly empowering to children. They find themselves doing things they never thought possible, managing situations that used to send them into a tailspin. Life feels better without the fear. And the pride that comes from climbing the ladder cannot be beat.